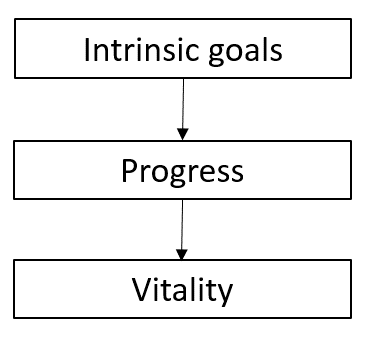 New research shows two interesting things: 1) that people achieve more progress on goals which are connected to intrinsic aspirations, and 2) that people experience greater vitality when when making progress on intrinsic goals. Abstract: While previous research has demonstrated that striving for personal goals connected to intrinsic aspirations benefits psychological well-being, the relation between aspirational content and goal progress has remained unexamined. Using a multilevel modeling (MLM) approach in two longitudinal studies, we examined the relationship between life aspirations at the level of the person and the level of the goal, differentiating the ability of aspirations at both levels to predict later goal progress. We found that students made significantly more progress on (and were more likely to attain) their goals that were more intrinsic in aspirational content. These effects were goal-specific rather than person-driven. Study 2 replicated the findings of study 1 and also revealed an interaction between intrinsic aspirational content and progress in predicting goal-related affect. 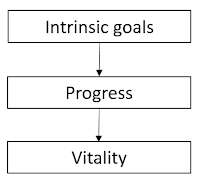 Specifically, we found that making progress on a goal that was more intrinsic in content led to greater feelings of vitality for that goal, while making progress on a less intrinsic goal did not. These findings highlight the benefits of setting goals connected to intrinsic aspirations (even for generally extrinsically-oriented individuals) and the value of shifting towards MLM approaches for research on goal pursuit.